Here’s a concise, easy-to-use Bible reference for students of all ages—especially teens who seek to learn more about the Bible and its times. 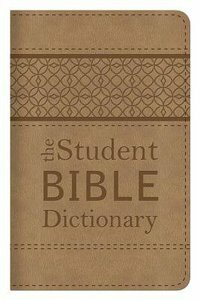 This handsome, compact gift edition of The Student Bible Dictionary (more than 750,000 copies sold!) features definitions and explanations of hundreds of Bible words, names, places, and concepts. About "The Student Bible Dictionary"
Johnnie Godwin spent many years in publishing, pastoring, and consulting, and now counts writing among his retirement activities. A Texas native now living in Nashville, Tennessee, Johnnie formerly served as president of the Evangelical Christian Publishers Outreach (ECPO). He and his wife, Phyllis, have been married nearly fifty years. Godwin earned a diploma of Theology from Southwestern Baptist Theological Seminary.